People love a side show, a spectacle and novelty. It’s an old sales trick to draw a crowd. As much as the circus freaks got people through the gates, it was the actual big top performers that made a lot of people come back to the circus year after year. After visiting Mamie Taylor’s twice, once with the Distributor and then later with Speedy, I can say the food will keep me coming back. Located in Chinatown where the Keefer Bakery operated last before shutting down, Mamie Taylor’s serves a menu that has southern classics like grits and fried chicken on it. From the first visit to the second visit, I noticed that the menus had change quite a bit. However it seems the main proteins (fried chicken, steak, pork chop) stay the same but the kitchen like to alter the sides that accompany them. Please note you will see discrepancies in some of the pictures and this reflects the 2 visits I made. I’m going to amalgamate the 2 visits, reviewing first all the appetizers and then the main entrees I ate. 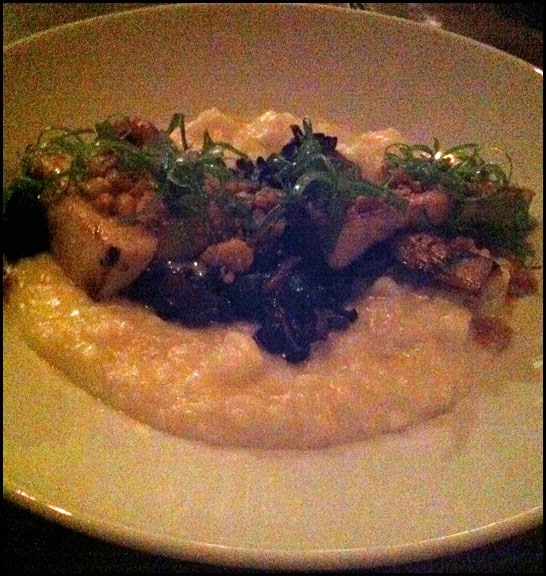 I was really impressed with the grits. Made from ground dried corn kernels (hominy), grits are naturally bland and has a similar texture as porridge or an over thicken bowl of congee. Mamie Taylor’s adds roasted mushrooms, cheddar cheese, butter, poached egg, shredded green onions and crispy chicken skin to increase the flavour of the dish. As you can imagine with all these ingredients, this appetizer had a complex array of tastes and textures. The grits themselves were smooth for the most part minus a small lump or two and very creamy. The egg yolk added another level of richness. The roasted mushrooms were an assortment of different kinds of fungi and were savoury. The chicken skin added pops of crunch in each bite; while the slivers of scallions provided a sharp taste to balance out the heavier elements of the dish. This small plate embodied what comfort food can be: hearty, warm and delicious. The roast beet salad was also a standout dish for me. It was simply roasted beets and carrots mixed with goat cheese and mint. The dish is about the quality of ingredients and pairing the right flavours together. The sharp and tangy goat cheese pairs well with the earthy sweetness of the root vegetables. I also liked the vibrant colours and how all the salad was presented. The server assured us this was highfalutin version. 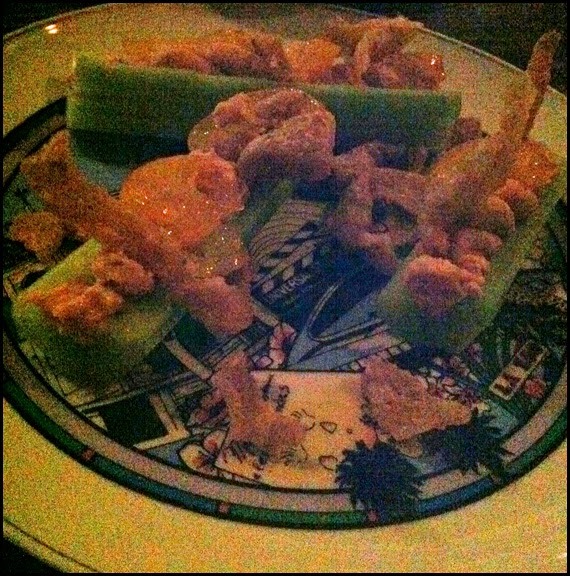 Instead of Cheese Whiz/Peanut Butter and Raisins, foie gras and kumquats were used along with crispy chicken skin. It was rich, savoury, sweet and refreshing. More importantly, it did remind me of my childhood snack albeit much more gourmet. The only appetizer that I didn’t care for was the Pea Salad (not pictured). It was simply a green salad with trimmed peas in it. There was not a lot of contrasting flavour. 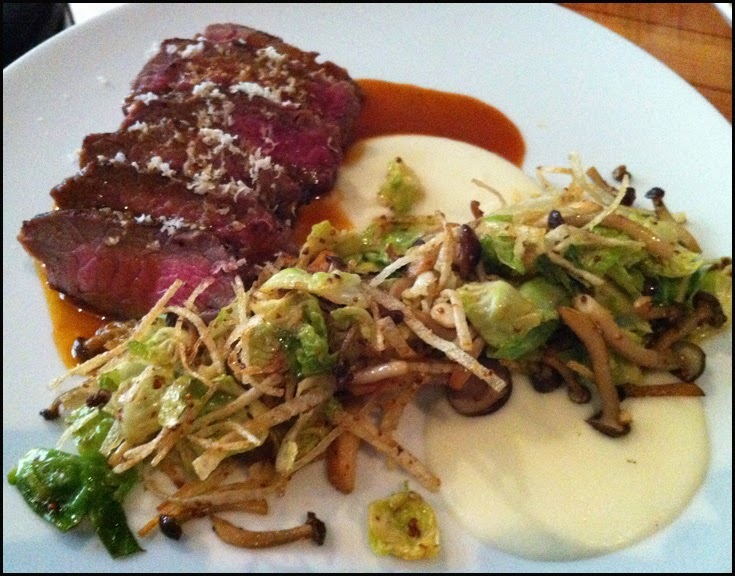 On my first visit I loved the texture and taste of the sides that went with the steak. There was a velvety smooth potato mash contrasted with crispy shoe sting potatoes. The Brussels sprouts and the au jus were also nicely prepared. The steak was prepared medium as we asked and it was nice and tender. However, I thought it was a little under seasoned. On my second visit, the kitchen staff had changed both the presentation of the steak entrée and the sides. The steak was not sliced and a new puree (possibly celeriac), beans, grilled beets and onions rings were the new comers. Speedy like her meal and thought every aspect of the dish was prepared well. After my first visit, I knew I wanted to come back to try one dish: the fried chicken. For the price, I was impressed with the amount of food I received: two decent sized pieces of chicken (dark & white), a small tossed salad, a biscuit, gravy, spiced pumpkin seeds and spiced spaghetti squash. Among the sides, the biscuit and squash stood out. 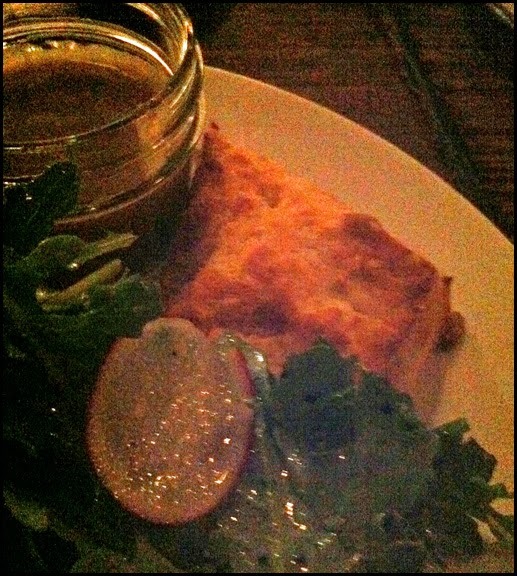 The biscuit was light with a slight crust. The inside was fluffy, buttery and was seasoned with ample amounts of salt. The spaghetti squash, with its trademark strands, was sweet but there was a hint of cinnamon and a slight hit of heat. 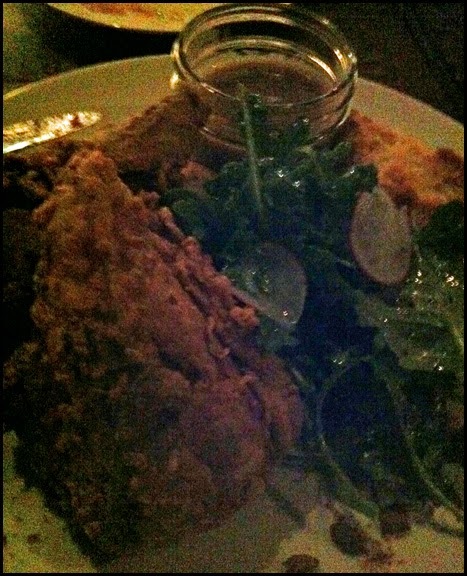 Mamie Taylor’s delivered fried chicken that was crunchy but incredible juicy, especially the dark meat. In the full light in my kitchen I was able to see from my leftovers, thyme and paprika in the batter. As much as the chicken was seasoned, the natural flavour of the chicken was the star. To be honest, I prefer dark meat as it has more flavour and stays more moist in comparison to the chicken breast and I thought the leg piece I ate was fantastic. After careful consideration, the curios employed at Mamie Taylor’s may not be a sales gimmick. It may be just swagger derived from knowing how good the food they served is. As result, they can do as they please even if it means using random decorated plates and hanging up dead animals. Overall, I really enjoyed my 2 visits to Mamie Taylor’s and so did my friends. I will definitely make return visits for just the grits and fried chicken.